If you do not have much space, today we are going to tell you some tricks that will help to make room look big and looks great. comes to decorating and disposing of everything necessary in them. cities also make that every day the floors are reduced. claustrophobic. Of space too closed and small. wider. It will give us the opportunity to look outwards and not feel the walls fall on us. give the sensation of greater depth. visually making the space more spacious, bright and open. feeling that our room is much bigger than it really is. The key is to take care of the details. 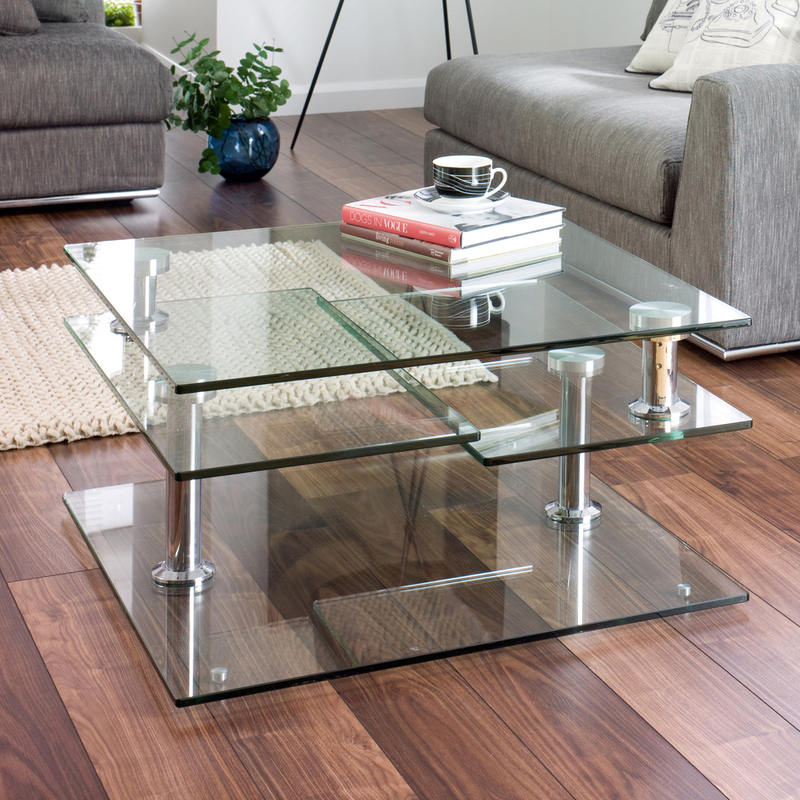 One of your best allies when it comes to growing a space are coffee tables made of materials transparent like glass or plastic. That way our view is free and does not get obstructed and overloaded with objects. The space seems bigger than it is, it’s that simple! Transparent, the fact that our gaze gains depth makes the spaces appear larger. A simple and simple trick that can help you give the impression that your ceilings are higher. Instead put the curtains just above the windows, try placing them near the ceiling. That way your space It will look bigger and the ceilings higher. But do not forget to use curtains that do not give heaviness. Make sure that everything is ordered or look for closed places to store it. The light helps us to give a feeling of spaciousness so if a space is small … add light without fear. Be natural or artificial light will help you expand. Also put different types of artificial lights, ceiling, floor lamps, table lamps … Everything will help. The corners are a stalemate so we must make sure to take advantage of them, either by placing a sofa corner or with furniture that adapt to its shape. That way we will make the most of the space. invisible are simple and economical and allow you to maximize your storage space. Do not think about it! 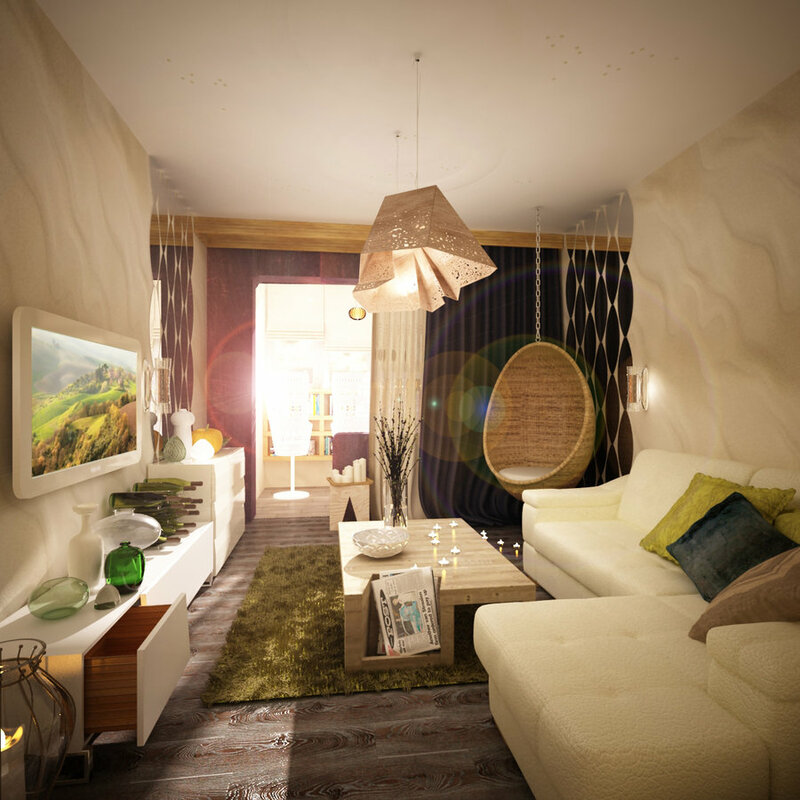 And here are our ideas to help you visually expand your room. Why do not you have to have a very large space, it is only necessary to know how to get the most out of it. In this article we will talk about Raw decoration that uses wooden elements in the most natural state possible together with current furniture. A commitment to the beauty of imperfection, which makes each element unique. or appear as natural and imperfect as possible. But we are not talking about a rustic style decoration or country house, on the contrary. It is about using a modern decoration of pure and modern lines, together with raw or raw materials that stand out for their unique and timeless beauty. They create a spectacular contrast that makes these pieces the center of all eyes. Where does raw decoration come from? The word itself means “gross” or “rough”, something like raw material, untreated. We live in a world that tries to look for a more sustainable, healthy and authentic lifestyle. We return to look at nature to include it in our daily life. In fact the consumption of raw food or “raw food” is very topical. Just like home gardens, organic food, recycling … And this movement towards healthy, eco-friendly and natural also reaches the decoration. Now we discover the taste for this type of furniture or decorative elements “raw” or in a natural state. The beauty of imperfection is claimed, which makes each element unique. Pieces of wood almost untreated, or that seem it, fresh from a forest to decorate our home. And so make us feel closer to nature. In this way raw decoration looks for elements with natural shapes, not symmetrical, and full of cracks and imperfections. Surely you’ve seen it in the magazine and fairs but maybe you still have not put the name. Let’s review some of its features. If an element stands out is the wood in its pure state, with cracks and porosity in sight. 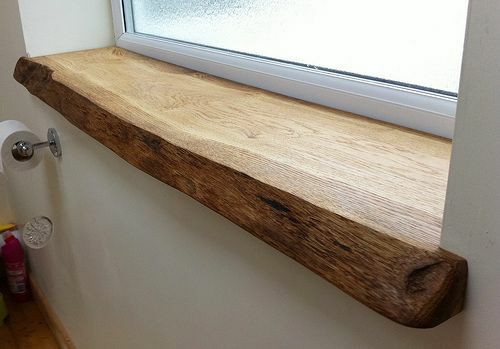 And it is that the wood is beautiful to the natural without additives or disguises. The wood should look like in nature or at least look like it. Which does not mean that we do not take care of it, with natural oils to maintain its beauty for a long time. But we will choose wood in its natural color and with the most rustic and pure look possible. Rough texture and full of imperfections and unsuspected and surprising forms. The raw decoration moves us to nature! We seek to create a calm and natural environment in which we can relax. This type of wooden natural elements will help us achieve it. The materials in use depends on our personal mood. Timber Natural helps us feel more in tune with nature and more calm. We must also prioritize the use of natural colors both in the wood and in the rest of the environment. The browns, creams, whites and in general all the colors related to the earth and the forest. A return to nature that will bring us the calm at home Don’t you love the idea? of high ceilings at home. 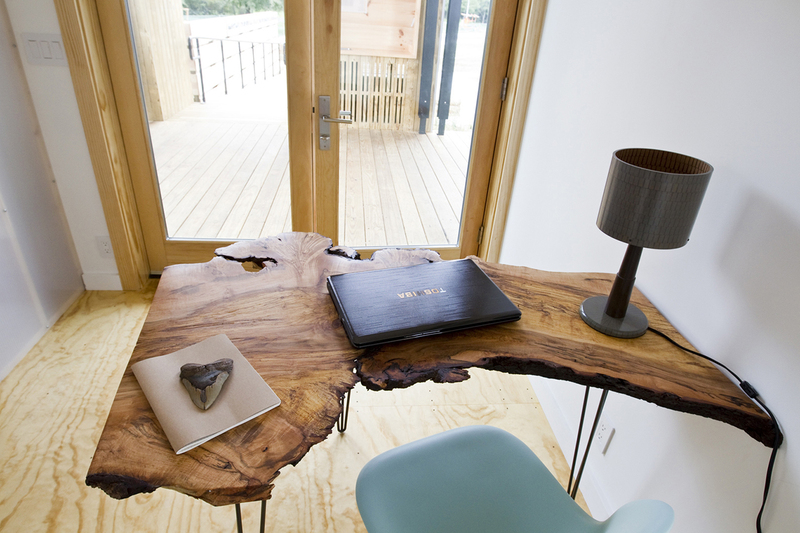 Another feature of the raw decoration is the taste for recycling and the reuse of wood. 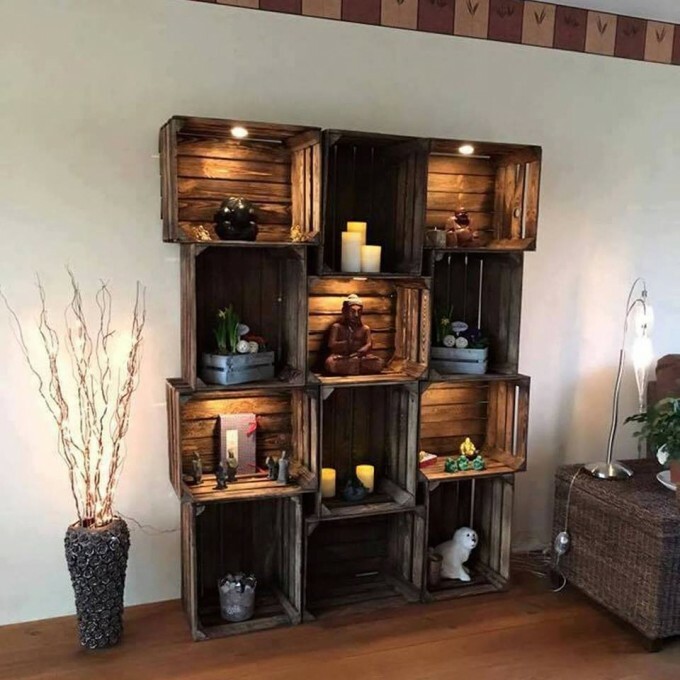 A) Yes We can recover pallets or pieces of wood to give our home a Raw style. For example, with a nice headboard made with pieces of a pallet. 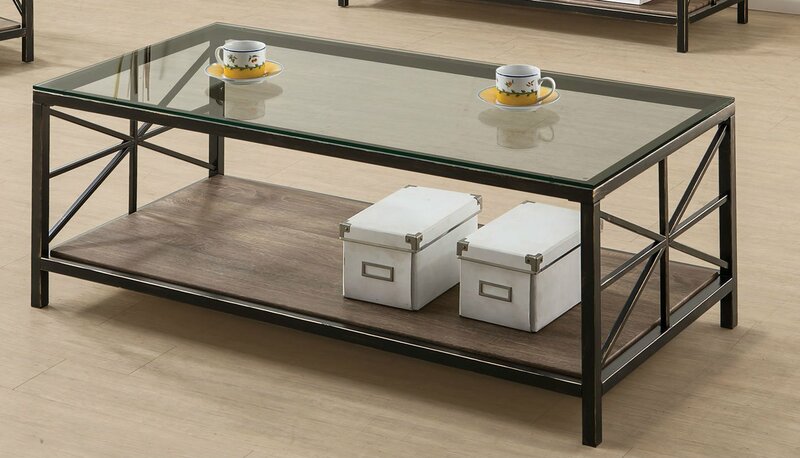 Or with a coffee table imperfect and full of personality that will make any space unique. Recycling is fashionable and is perfect for introducing raw decoration in our home Here are some ideas that may be useful to you. Let recycling enter your home! How to incorporate the raw decoration in our house? As we have already said, you do not need a radical change, just include some wooden elements in your state more natural as possible. A good idea is to take advantage of recycling as in this article about recycling doors wood. We can choose to include small furniture such as wooden boxes, stools or side tables. OR also old wooden stairs. All these little elements will bring warmth and naturalness. We can use these elements in any room of our home, as it goes perfectly in all they. If you have to change an important piece, such as a table or a dresser, look for it in wood, natural colors and that there are cracks, small marks … It will become a key piece in your decor. So you want to start raw decoration? something or even we have introduced it at home when we discover that it is the latest trend. It is partly what happens with the Raw, we have been watching it for some time. Little by little the wood has been gaining space and, at the end, it has managed to consolidate itself as a trend. And I’m not going to complain, because I love it. It’s been a long time since I keep an eye on those dining or kitchen tables full of cracks and crumbs that seem about to tell us about history. And the wood has so much to contribute to the home. Do not you think? And it is also proof that the recycling continues to gain strength. Another good news If you want to see more authentic products that you can use for raw decoration, please visit our store. Vintage Perfume Bottles are as attractive as aromas. When we finish the content and we want to preserve these delicate bottles, creativity is our ally. An authentic beauty: glass jars and perfume bottles of authentic retro or vintage style. Yes, used in past centuries, and forgotten in recent decades, these containers and bottles come back, hand in hand with the vintage style , which continues to accompany us this year. The perfumes, at the beginning, were in very simple bottles, but over time the perfumers realized how important the beauty of the bottle that contained it also represented, and that is why they called on great glass carving artists to make them. They presented them with a series of bottles to choose for each type of perfume, taking into account the name they were going to assign, the type of perfume in question, the type of woman or man that was intended and many other personal aspects so much of the perfumer, of the house of perfumes and of the original creator of the bottle. Many times, these jars were sold as containers to carry the perfume or cologne to choose. These types of jars are still sold, adorned with golden filigree, for example, recalling the style of art decor that had so many fruits in all kinds of artistic expression. 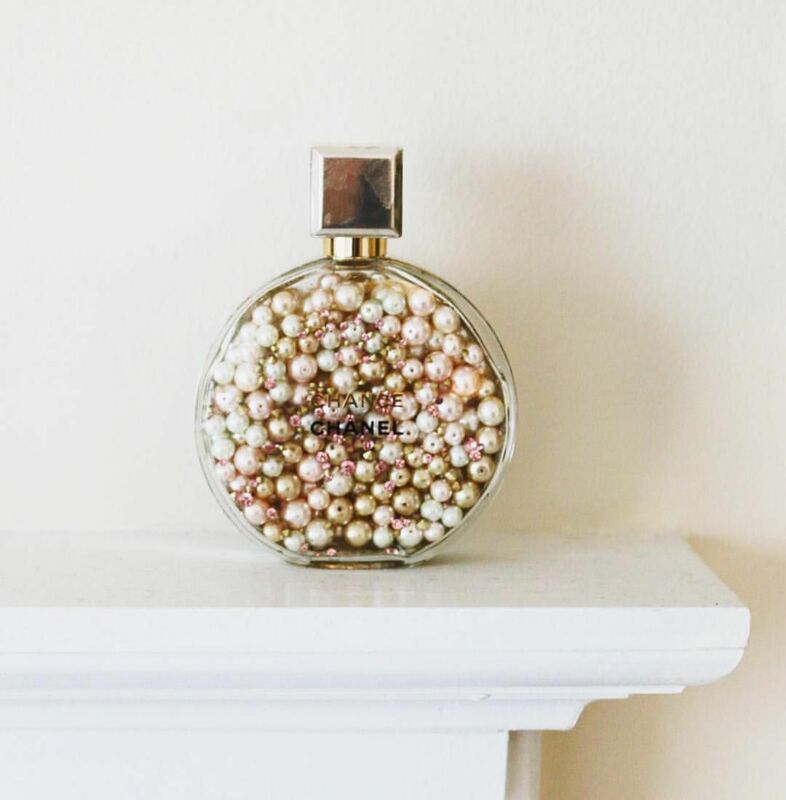 Losing its original use, because nowadays, most perfumes come already bottled, these jars offer an original decorative alternative, ideal for decorate our bedrooms, toilets, bathrooms, and much more. With aromatic oils, tinted waters, minerals, bath salts, dried flowers … there are many alternatives with which we can decorate using these bottles. Bases for flowers: in the toilet or guest bathroom. As a centerpiece to decorate a baby shower for a girl, or an Audrey Hepburn-style brunch with your friends. Mini candle holder for a romantic night with the husband. Place them on a mirror to add even more drama. Tint them with vegetable dye and hang them on the balcony or in the garden with aerial plant or with water with sugar to attract the hummingbirds. Create a bedside lamp for a room for a girl. Those you decorated with ribbons and tags of the dates can be placed on a wall cabinet and shows your collection, will serve as a detail for your bathroom. Empty perfume bottles can be used as containers for glitters and nail art. Remove the top spray mechanism and vintage perfume bottles can be used as flower stand. Vintage perfume bottles can be used to store various aromatic oils. Present different types of aromatic oils that you will easily prepare and can keep in these beautiful bottles. Interested in some more vintage decoration? Do not forget to checkout our massive collection of authentic vintage accessories that you can order in the comfort of your home. For a few years now, a well-marked movement has not ceased to be a sensation in the world of fashion as well as in decor, that is using Vintage Storage to decorate your home. This vintage trend, awakened among other things by a certain nostalgia for a society in constant evolution, aims to make us take a step back and revisit the past modes. In decor, this mode is to take some elements of the past to integrate them into our current decor. These elements may have undergone a slight transformation to match the decor in place, or they can be presented as such, to create a meticulously timed shift. In order to reproduce the vintage / retro style at home, here are some ideas to use vintage storage accessories to organize your spaces with style! 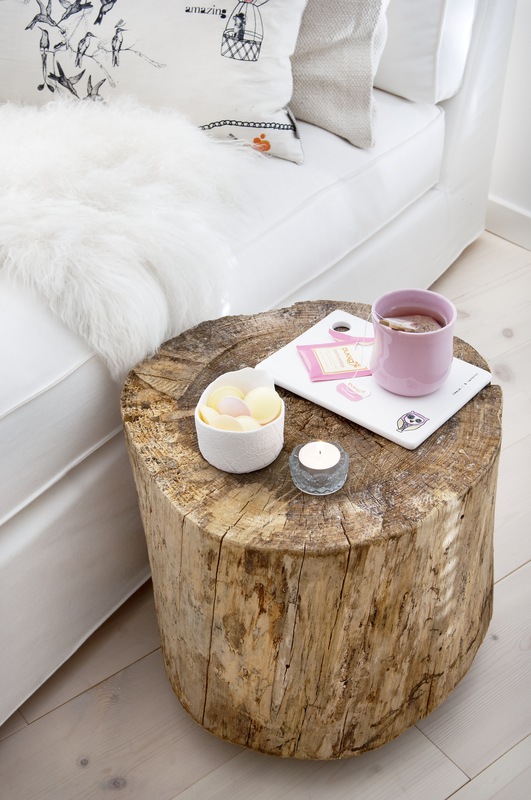 Reuse an old trunk purchased from an antique dealer or recovered in Grandma’s cellar to transform it into a side table with built-in vintage storage. Beautiful, good, cheap: a wall of zinc lockers to store and organize the clutter of the office or the entrance. Easy to fix and versatile! This revamped school desk will give your kids a great little place to do homework and store school supplies. 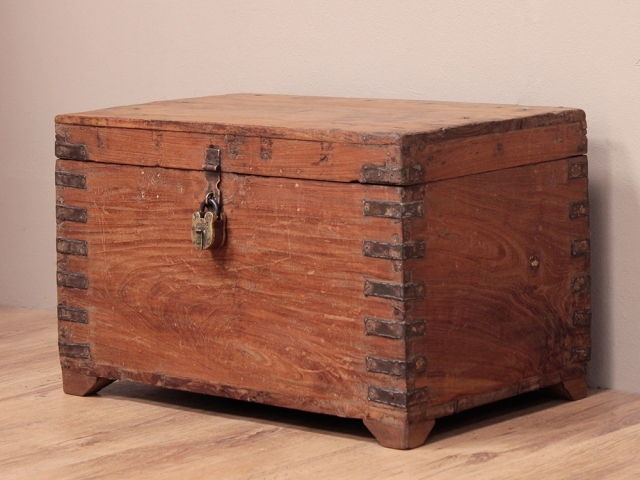 A Perfect vintage storage which doubles as a usable piece of furniture. An original way to use the famous Mason jars. Placed in a box or an old wooden drawer, they will be perfect to accommodate pens, brushes or flowers. A Vintage storage decoration at friendly price! 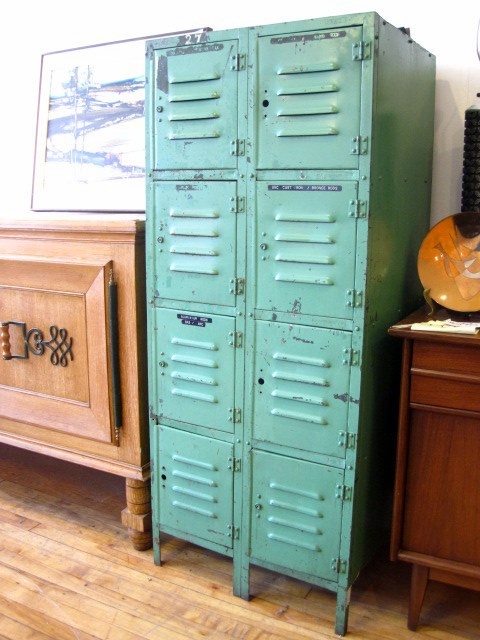 Old locker lockers will bring an old school look to your home and offer a useful vintage storage. Placed in the entrance, they will offer enough storage for your jackets, coats, handbags, scarves and shoes. Vintage makes sell. 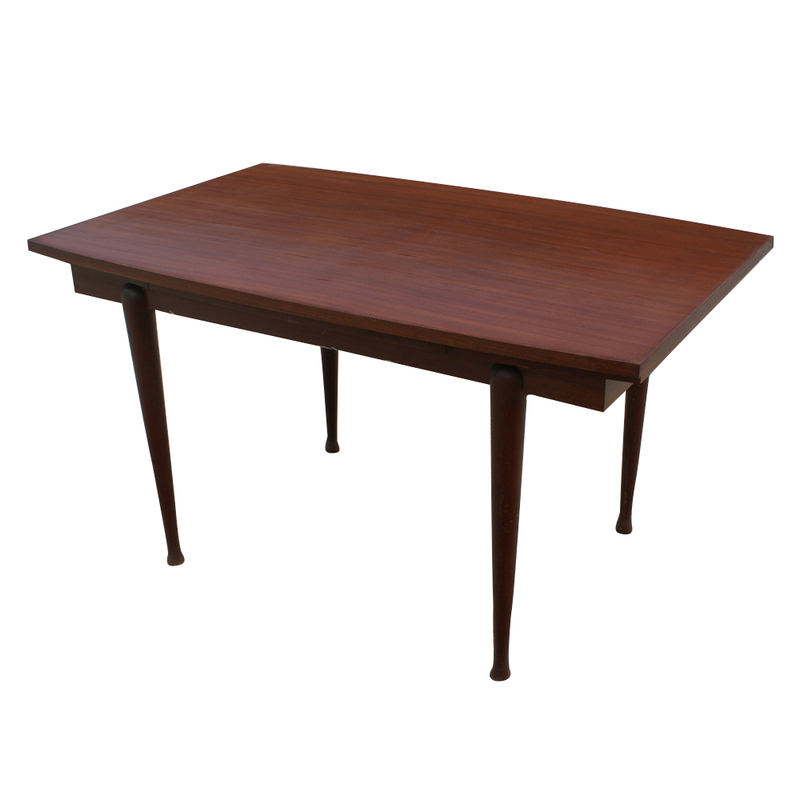 Some shops have understood and offer retro furniture at affordable prices. 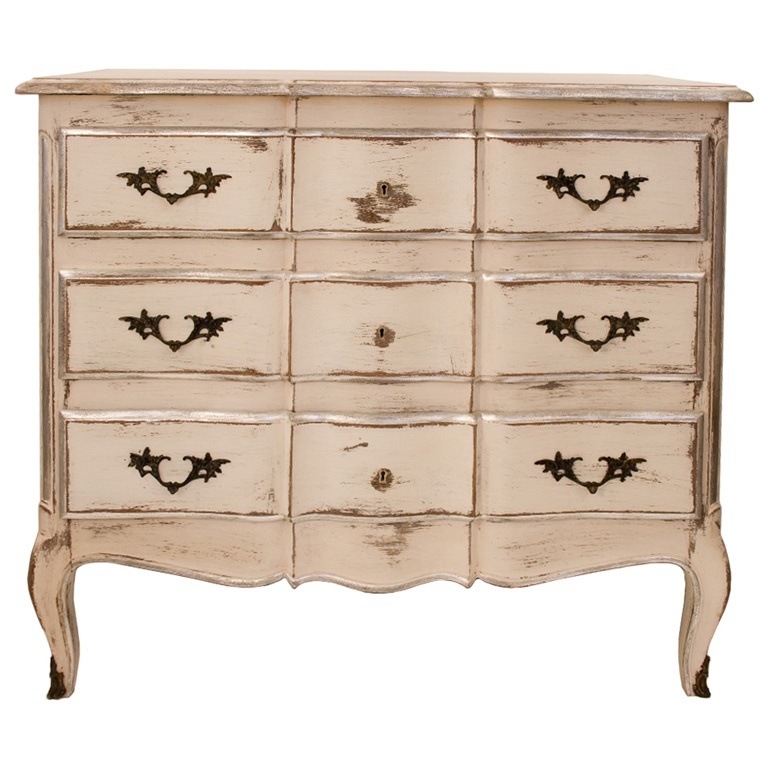 For those who have beautiful antique furniture, but would like to give them a more current look, know that there are professionals in revaluation of furniture. You can also transform them yourself! It is a good option to harmonize with your decor. a few screws and you’re done! Initially used as advertising or propaganda support for the street or public spaces, the poster is more and more trend in the interiors. This is not surprising since it is a simple and very effective way to dress our walls without embarking on large (and expensive) work. Printed on paper,metal or fabric, Vintage Posters & Signs adopts multiple dimensions to fit any interior and any style. ideas! If you also want to adopt a vintage poster , here are some small tracks to not go wrong. Your interior is a pretty declension of sober tones. Your browns, beiges and whites need to be revived! Dress your house with a pretty colorful poster. The trick: This advertising poster reinforces the bachelor spirit of this show while stimulating it. Synonymous with conviviality and meals with friends, the bistro style is no longer confined to cafes and invites itself into the dining rooms to bring them warmth and friendliness. Use and misuse vintage posters selling alcohol and products to consume. 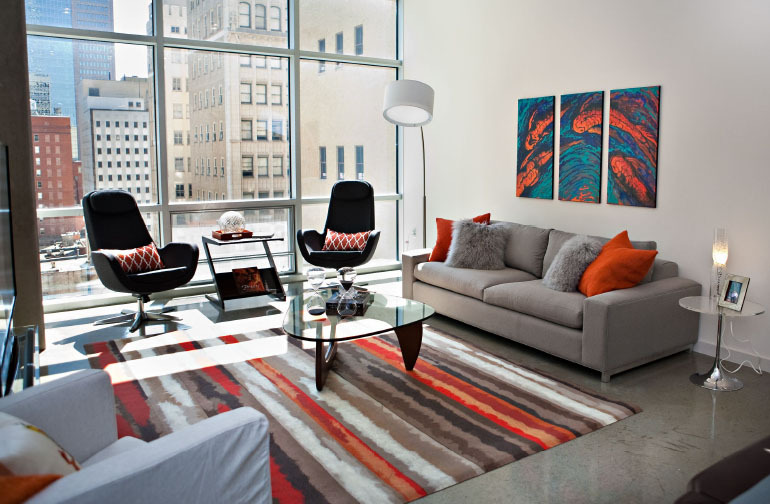 The trick: Feel free to play the color and modernity when you choose your chairs for a nice contrast! Your interior is structured and super disciplined? Opt for the architectural posters with powdery colors! The tip: To further strengthen the organized spirit dear to the profession, multiply small vintage posters by aligning them. It will then approach to savor the details. Simple but very effective! You’ll be spoiled for choice when it comes to vintage advertising posters . Indeed, many of them were used to make you want to travel or to put forward a sporting event. You are a car fan, bike, ski, sail, bet on the poster to stimulate your space. The trick: This vintage poster gives a nice retro style cottage in this contemporary interior. Check out some great Vintage Home Decoration Accesories here! Want to get a message across? Give voice to your walls and opt for posters that play with words. page with your word processor, print and put under glass. You will have the most personalized decorations! pockets of these albums are real vintage jewels . Tip: Attach some of the most colorful pieces in your collection to the wall. For a vintage and graphic decoration ! 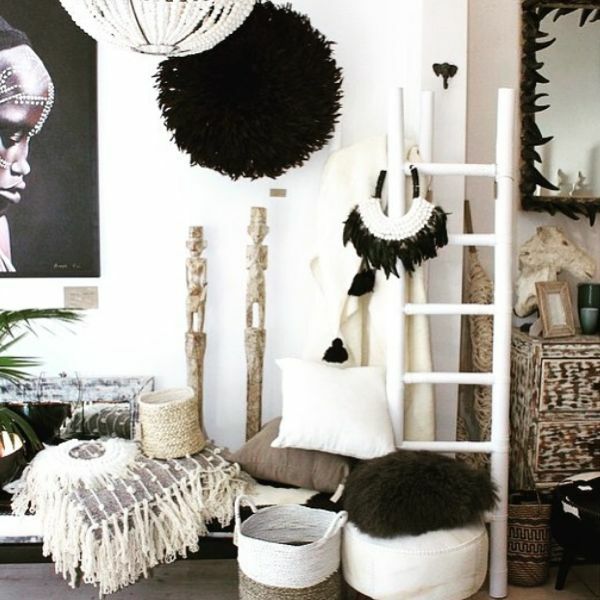 Every trip, every experience, every visit to rakes and antiquarians is giving us objects and memories that become part of our home creating a space with an eclectic style that makes our home unique and very personal. 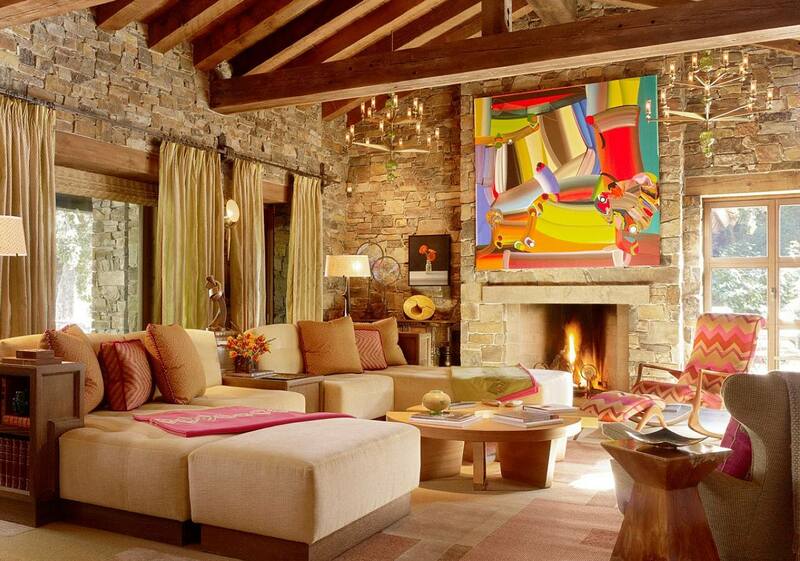 For some time now we have been seeing how little by little the eclectic style is imposing itself on decoration. And that is to decorate our home with a single rigid and very defined style is outdated. Each trip, each experience, each inherited element, each moment of our life, each visit to rakes and antiquarians is giving us objects and memories that become part of our home creating a space with a unique and very personal style. But we run the risk of creating a chaotic and overloaded environment or it seems that we live in a museum so today we tell you what are the keys to the eclectic style, you may discover that it is perfect for you and you did not even know it! But what is the eclectic style? 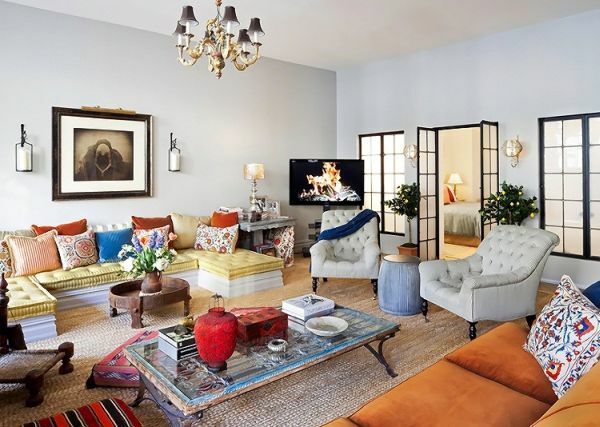 The eclectic style in decoration is characterized by the mixture of styles, epochs, patterns, textures and materials creating a unique atmosphere, full of strength and personality. The word eclecticism comes from the Greek “eklegein” whose meaning is to choose and was born as a philosophical term that refers to the conciliation of different ideas and visions of the world. In architecture it began to be used from 1860 with the mixture of different styles and epochs. 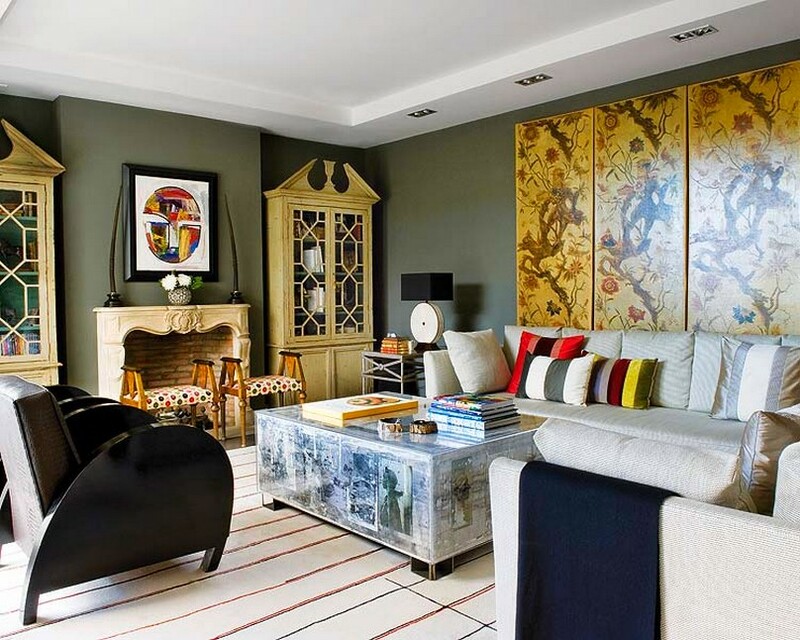 The eclectic style is perfect for people who do not feel defined by a single style of decoration, but prefer to mix different pieces, to their liking and without rules. It is a style that seeks the beauty of the environment by mixing and combining elements that can come from any time and place. This leads to creating unique and very personal and unrepeatable environments according to the personality, experiences, lifestyle … of each person. It was born with the reluctance of artists and architects to stick to a rigid style scheme and their desire to mix and experiment with them. And today is one of the trends with more strength in decoration because in a connected and multidisciplinary world the unique styles seem to have been somewhat obsolete. 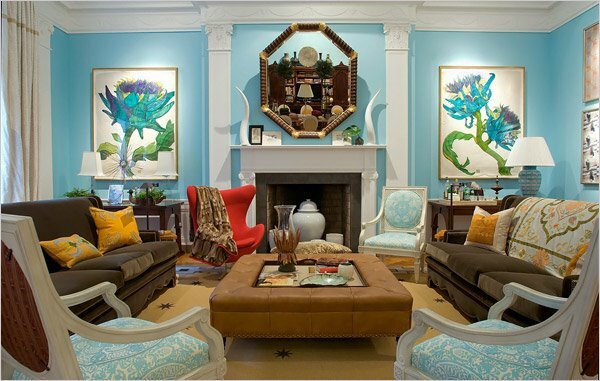 It is difficult to define it because it is based on the lack of definition and the unique mix, but we can specify some aspects that mark the eclectic style or that will help you when using it in your home. There are no limits when it comes to decorating and looking for inspiration, so we can use ideas seen in a trip, a movie, the inspiration of a book, a past time, …. to create a thematic line that will help us when decorating. It is one of the characteristics that makes this style unique, its lack of limits. A considerable part of the charm lies in decorating with objects that originally were not conceived as decoration elements, but for more practical purposes and that will give a unique air to your home. Let yourself be carried away by what you like and make you feel comfortable and at home and build from it. They can be your memories of exotic trips, they can be your most special books, can be some precious objects inherited or recovered at some auction … let your creativity flow and combine elements that at first glance do not seem to have anything in common. The result will surprise you! Not that any past era is better but if all past times can contribute something to our decoration. One of the characteristics of this eclectic style is to mix pieces from different periods without any complexes simply by focusing on the beauty of the pieces, what they transmit and contribute to us. But try not to be too heavy pieces or that the set is balanced. 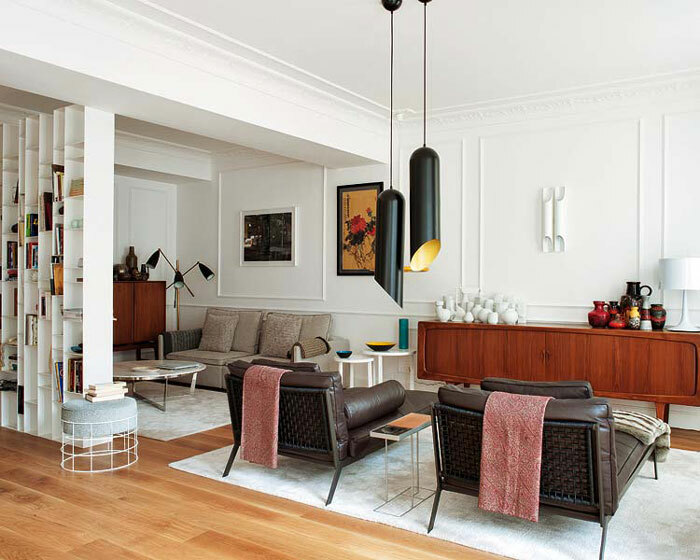 The inherited furniture is mixed with other more modern or design to create contrast. Have fun decorating and above all be yourself, let your creativity guide you and create a unique space for you and your family in which you feel identified and at ease. There are no rules and therefore what should be what you and your preferences send. There is no good or bad but if you have to try to find the balance to avoid environments too baroque and heavy. Let your tastes, your memories and what makes your special life look also in your home. 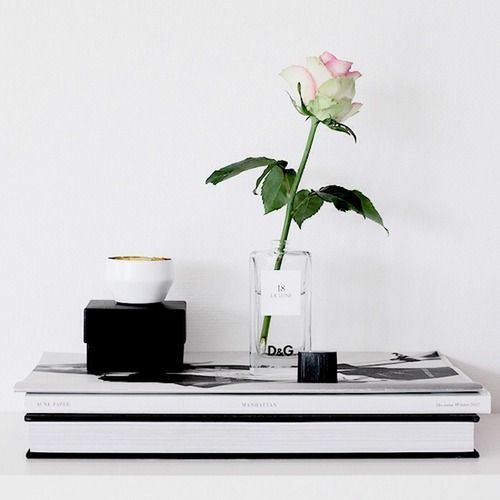 Decorate with those objects that transmit you passion for living and make you feel at home, mixing and trying to get the atmosphere you are looking for. Forget about the right and wrong and bet for you and your personality, what matters is how you see it! Being a style in which furniture, fabrics and objects take a lot of prominence, the best thing is that the wall of the decorations is more neutral to allow your decorative elements to shine in all their splendor. Although you can also risk with some strong color but better not to create too much mixture in your walls so that the objects get all the attention. Although, who said fear? The textures should be mixed so that the wallpapers or the walls can also be a good idea. So that it does not turn out “too much” it looks for a certain harmony in the colors of fabrics, upholstery and furniture to create balance and that does not look like a messy jumble of objects. It is your home so you should feel comfortable in it, so avoid the museum effect with too many objects as an exhibition. It is good to have memories of your travels and experiences and expose them in your home as you see fit, but if you pass you can create the opposite effect and become too cold and without personality. Think carefully what pieces should be in view and look for comfortable furniture such as sofas and armchairs rather than spectacular pieces but in which it is difficult to live. The amount is also important, do not overload the space because besides looking smaller the effect will be claustrophobic and falling on the walls. The fabrics are another element that can help us in our eclectic decoration, from the classic oriental rugs brought from our trips to cushions, quilts and all kinds of elements that provide warmth and at the same time color and pattern. Do not be afraid to mix them because they will help you to give warmth and at the same time authenticity to your decoration of eclectic style. Also the wallpaper can be a very good solution that provides texture to your walls. Do not be afraid of the mix, of course, either go crazy or you will get the opposite effect. Balance is the key. Also the mixtures of different materials are key as well as elements of different cultures and origins that nevertheless when they are united create a harmonious whole, ¿complicated? It’s a matter of trying to find the perfect combination. For what we spoke before, order is paramount to avoid overloading the space and that there are too many elements at once in a space. Measure well the space you have and the elements that you want to expose in it so that they shine in all their splendor without overloading us. Sort and re-order items periodically and if you include new things, you have to undo or save others. We can not accumulate without control because we will end up creating a motley and stressful group around us and not a home. Each object must have its place. So far our vision of the eclectic style, a style that every day gains more followers for its strength and personality. Because it does not put limits to our creativity when it comes to decorating a space until it becomes something unique that reflects our personality and more important experiences. That is why it is a style that is sure to continue growing strongly in this world where every day we travel and know more cultures, countries and we want to incorporate these experiences into our daily way of life to enrich it and give it more content. You can see more images on my Instagram page . 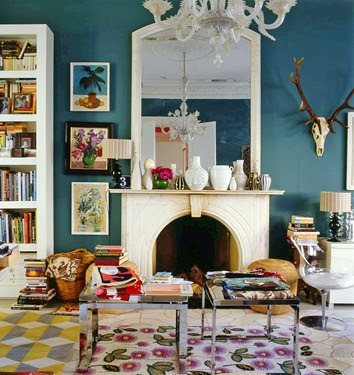 And you bet on the eclectic style in your home? Leave me your comments and ideas on this subject and I will be happy to answer any questions. Happy week. 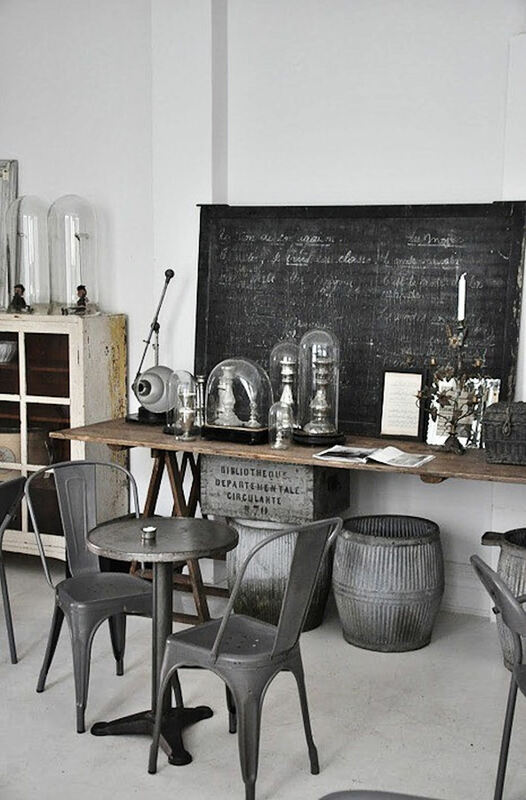 Let’s see the 6 keys of vintage industrial decoration that you should not forget if you like this style of decoration. A style that little by little has been gaining ground, do you come to know them? The industrial style was born when abandoned industrial spaces such as warehouses or offices began to be converted into homes in the 50s. First, by simple necessity and by its low costs, later becoming a fashion and a new style of its own that we know today as lofts These are diaphanous spaces where divisions are reduced to the maximum and decoration to a minimum giving prominence to the basic materials and structures of the building. The industrial vintage recovers elements of the industrial era to give them a new life. Let’s see what are the keys that characterize this style, do you come to review them? One of the characteristics of the industrial vintage style are brick walls, cement or concrete, rough and unpolished that give off personality and character. In essence the structures are maintained more or less in their natural state with the walls unfinished or that was the idea … now we have gone on to decorate them that way directly. Absurd? probably … but it certainly has its charm. Their influence has been such that they have created a school and now we can see this type of walls in all types of homes and especially in restaurants, shops, workshops, … Without a doubt the exposed brick walls have become common but in the vintage style industrial goes beyond and let themselves look worn or worn by the passage of time and wear and tear of use. Risky walls but that have nevertheless managed to carve a niche, more for workshops and businesses to which they give personality and character. And in this context the walls with uneven finishes that seem to be unfinished or that have been left half-finished also find their space. One of the most used techniques to give this effect is to decorate them with watercolors to give that uneven effect. Or you can find wallpapers to make it much easier to get this old-fashioned wall effect. What do you think, would you put it at home? Probably not, but for a coffee it can be a perfect and striking solution that attracts customers to visit us. The charm of the decadent. Cement walls are another typical element of industrial vintage, since many factories were made with this material. Now walls are created that imitate their texture or are covered with cement plates directly referring to the factories where they are inspired. The gray color is undoubtedly one of those that dominate this type of spaces although we can soften it with a warmer tone like brown or more luminous like white. Do we bet on cement? The vintage industrial decoration leaves the structures in sight: beams, pipes, cables … everything is exposed to our eyes without a trap or cardboard. If you have metal or wood beams now is the time to show them off in all their splendor. Or leave the pipes in the air and give a simple coat of paint. But to be able to look at its full splendor we need to have high enough ceilings in which the beams take all the leading role. The cables are also visible. Recently we talked about the wires in sight , a trend that comes from the North but that goes hand-in-hand with vintage industrial decoration. The cables will also be part of the decoration and will help us give an industrial look to any corner or space. If they are bulbs or flexo type even better. Another characteristic element of the offices are the large iron windows that are now also used to separate spaces such as the bedroom or the sink. Iron is one of the necessary elements in this style and its combination with glass gives us a way to separate environments without creating barriers that we are seeing a lot. And it does not surprise me! Because the result is really beautiful, do not you think? They are also ideal for bathrooms, used instead of screens as we saw in the article on baths to the last . 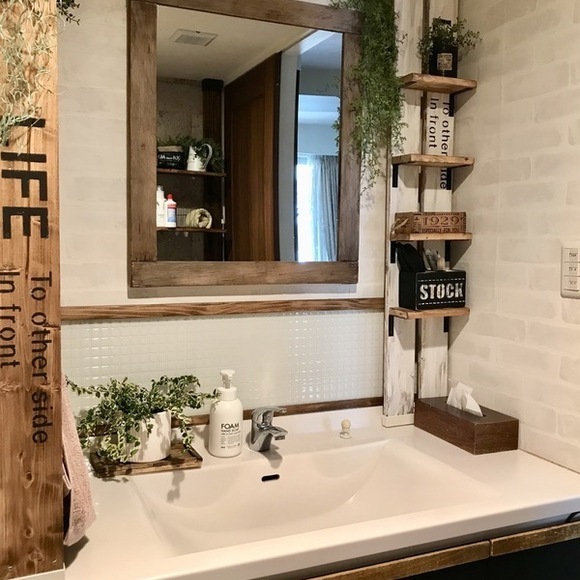 I certainly love the idea of ​​putting these types of doors in the bathroom, I think it gives a very original industrial touch and full of charm do not you think? 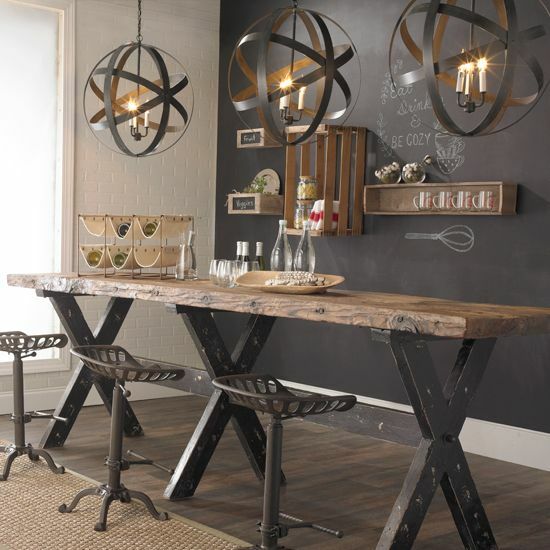 If something can not be missing in an industrial vintage decoration is the use of metals: iron, steel, bronze, copper …. We can use them in all kinds of objects but without a doubt the tables are one of the elements that will give us the flavor of an old workshop or factory. Surely if you look for an old table with that industrial air that makes them unique. Another metallic touch that can not miss are the shelves, filing cabinets, lockers or metal cabinets … a classic from the industrial era that now come back to prominence. Recover these elements in the decoration and also will be very useful. If you do not find them old, you can find pieces that imitate the originals. The chairs, stools and desks also join this passion for metal and is that these are elements designed to last and withstand the passage of time and continued use in offices and workshops. Surely you can find scavenging rakes, thrift stores … Do not let them escape! Another element that can not be absent are the metal lamps or lamps that have returned with force to become fashionable in recent times. Let them hang from your high ceilings or place them next to a work table or sofa to get that key functionality of industrial vintage. Wood brings a warm touch to the industrial style so full of gray, metal and walls without artifacts … The range of colors that dominates in this style are white, gray, black, metallic and some blue. In this context, wood will provide warmth. But we also look for wood in its purest form, without ornaments or disguises. Tables, desks, chairs … even the kitchens are dressed in wood in contrast to the hostile and cold environment of the industrial age, bringing a bit of heat to the environment. Difficult to resist that beauty so natural and without artifice! And if your budget is not enough to buy this type of furniture you can also take advantage of recycling pieces of wood in coffee tables or study tables. The effect will continue to be spectacular. You just have to add other elements such as metal wheels or a flexo to look like authentic vintage pieces. The passion for the industrial past brings back many objects that had already lost use or were stored in any corner. How we counted on the decoration of naturalist style , the past shines again and all the objects that remind us of that industrial age are very topical. Old pulleys, metal wall clocks, old fan blades, old telephones, old tool boxes .. everything returns to find its place. So go for flea markets and antique shops and check your basements and attics well because you will surely find pieces that deserve a second chance. 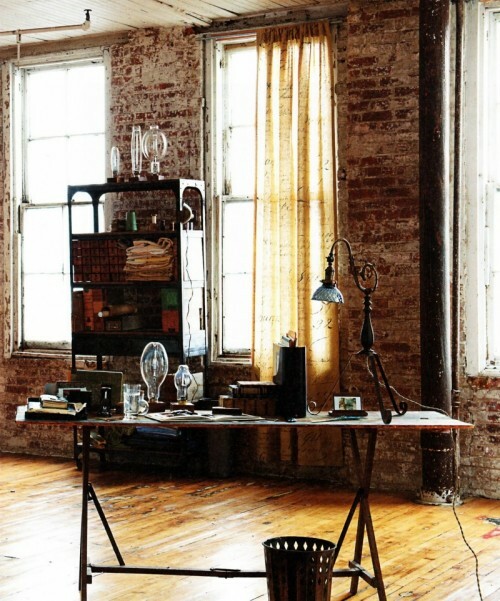 And here are our six keys to achieve an irresistible vintage industrial decoration. How will you always find more photos on my Pinterest page to inspire you? It is certainly a style that has gradually been imposed although it can be somewhat cold and perhaps more of the masculine taste. I do not see myself decorating the whole house like that, except if I were the privileged inhabitant of a New York loft or similar. But to decorate a particular area of ​​the house if I like it a lot, especially for study areas or a juvenile room, do not you think? And you bet for industrial vintage at home or prefer to see it in cafes and shops? Because every time we see more cafes decorated with this style, which I love, but I put a but .. if we are going to recycle chairs, I think it’s great, but please make sure before the chairs are comfortable. How many times do you love a place because of its design and then you run out because the chairs are hellish? It is a reality that you have surely lived. And here the new news, I hope you liked it. Happy week, we read soon. The rustic style is usually associated with the town house or the second residences in the countryside. However, it is also possible to give a rustic look to our homes in the city, including some decorative elements such as lamps in this style. Undoubtedly, the materials par excellence to endow that somewhat wild aspect are those related to nature, such as wood and stone. Together with them, metal is the perfect complement . If you are thinking of decorating your house in rustic style you can not miss the ceiling lamps or pendant in aged metal. Depending on the room you are going to light, you must choose one model or another. Dining room lamps should provide more intense light. For this the best are chandeliers, which may have more or fewer arms depending on the surface of the room. You will find them with many designs: in copper metal, black forge, in light color, with glass tulips or with small screens. You just have to decide on the model that best matches the rest of the decoration. In very rustic environments such as those of country houses, we can even find recycled lamps, made with old carriage wheels and chains. The corridors will be very beautiful and rustic if you install ceramic tiles as appliques . These pieces, besides being fashionable, are very decorative. You can find them at any craft fair or market, hand made with the most diverse motifs and already prepared with the wiring. The ideal companions of the rustic kitchens with aged-looking wooden cabinets will undoubtedly be the kitchen lamps made of copper-colored metal , like those tools and old pots, with which you can complete the decoration. The rooms need different types of lighting. The bedroom lamps should provide a soft light next to the bed. A few night lamps with the forging foot and an old-looking burlap or glass fabric shade will give a dim light that will allow you to read in bed. For the ceiling, choose a lamp in the same tones as the tables. The forge in light colors goes very well with the dark furniture, since they lighten the space. As you can see, every corner of your home can acquire a rustic look with a rustic lamp that combines the materials that remind us of life in the countryside: metal, wood, rustic fabrics and ceramics. The hall is the place to welcome visitors. It is the first thing we see when entering a house and we already know that the first impression is the most important. Take care of all the details of this stay is crucial to get a cozy atmosphere. The decoration of the hall should make others feel comfortable and reflect our personality. In addition, it must contain some important details such as a mirror that enlarges a space that is usually reduced, a coat rack, an umbrella stand and some decorative objects such as vases or paintings. However, for all these elements to stand out and produce the desired effect there is something that we should not neglect: a good lighting of the hall. The lamps in the hall should provide a light to be intense enough to counteract the glare effect of the sun when someone comes from the street for the day. In addition, for the night we must have a lamp that illuminates more dimly. If we have pictures or some decorative object that we want to emphasize we can use a direct light, focused towards it. On the other hand, it is common that before leaving home we do not take a last look in the mirror of the entrance and forget to turn off the light when leaving. A good solution are the automatism that turn on the light when they detect us and turn it off when closing the door . They are very simple systems to install on which they can advise us when we go to buy lamps for the receiver. Since the receivers are usually small and without natural light, you have to think carefully about how to illuminate them. One of the most recommended solutions is to place recessed spotlights in the ceiling and oriented so that they do not produce shadows. Some sconces on the wall, next to the mirror, will be the ideal complement. Another option is to replace the spotlights with one or more soffits. The hanging lamps must be installed only if we have a house with high ceilings or square and spacious hall. Otherwise, the lamp will produce shadows and, even, a visit may collide with it. A table lamp will also be a good complement to lighting if you have a piece of furniture with enough free space. If not, you can replace it with a floor lamp. Playing with different intensities of light and creating spotlights in the hall will get the light evenly distributed and the space visually enlarged. The industrial style emerged more as a necessity than as a fad back in the 50’s in New York City . There, factories and warehouses in disuse began to be enabled as homes. Its origin is what marks the peculiar characteristics of this eclectic decorative style that is based on bare walls and combination of antique furniture with metal objects with aged appearance. One of its advantages is that many pieces of furniture and decoration can be purchased in traces, which means that there is no need to make large outlays. Glass bottles, aged suitcases and old books are some of the elements that can not be missing . The key to succeed is knowing how to combine them with the rest of the home decoration. 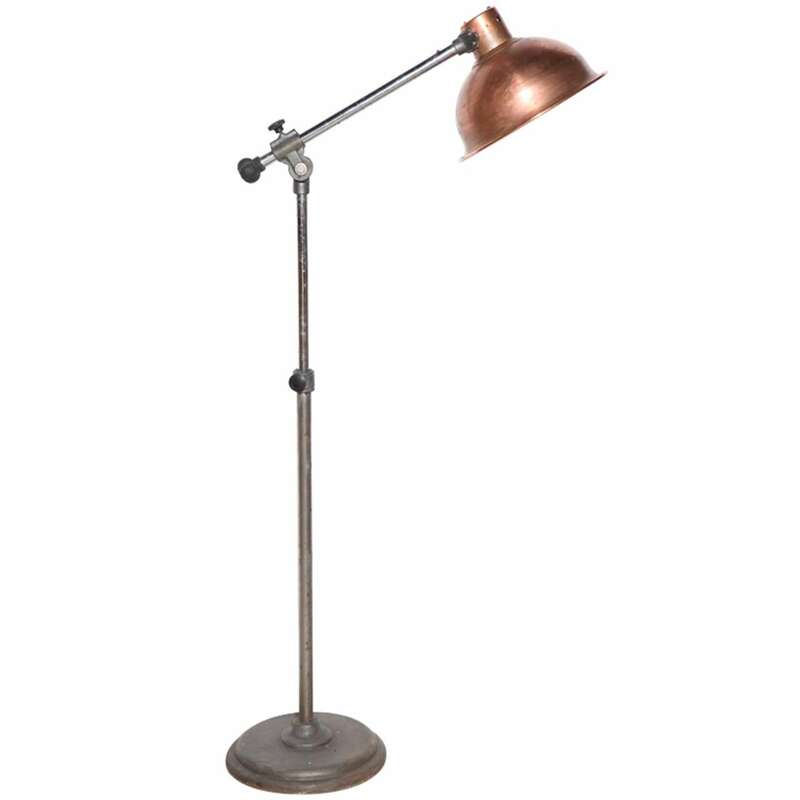 For industrial-style lighting, metal lamps are mainly used . In our lamp shop you can find many of them. A trend that is very fashionable in terms of industrial style lamps are the filament bulbs that remind the incandescent bulbs of all life , but now are LED type , which consume a small part of the energy they consumed old . The cables are visible and can be colored and covered with textiles. Another of the keys to industrial lighting are the floor lamps that remind the spotlights of the film studios. As for the range of colors , in the industrial style blue, beige, white, black, gray and brown predominate , in addition to the metallic ones such as bronze and copper . The earth and dark tones are ideal in this style , but to achieve a more luminous and cozy environment should be decorated with more light than dark tones . The blacks and grays produce a much more sober effect. 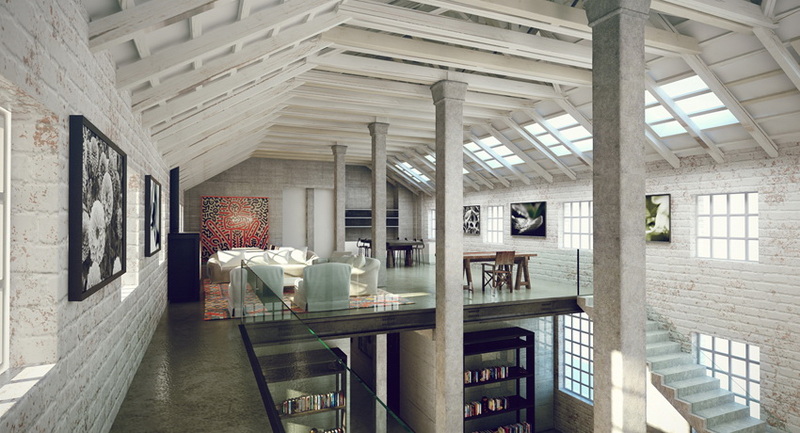 The industrial style lighting will be the perfect touch to achieve that atmosphere in decoration. But lamps of this style fit very well in other environments . For example, they combine perfectly with modern-style furniture . 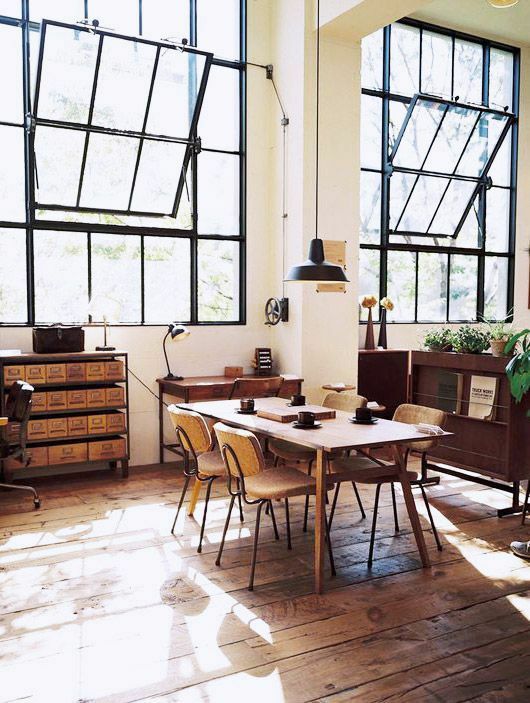 A trick to get that decadent air of the old factories and warehouses that originated this style is to expose the wires of light , choosing for it some that are more decorative. We can also hide them but pass them through copper, black or silver colored tubes that are visible . This, in addition, will allow us to place the points of light where we are most interested without worrying about the cables being seen. Finally, the spotlights on the ceiling and the wall sconces adapt very well to this style and provide a focused lighting that helps highlight any corner.